Claude Oscar Monet Art Gallery - The complete Oil Paintings For Art Lovers! 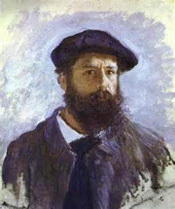 Claude Oscar Monet (French: 14 November 1840 - 5 December 1926) was a founder of French Impressionist painting, and the most consistent and prolific practitioner of the movement's philosophy of expressing one's perceptions before nature, especially as applied to plein-air landscape painting. The term "Impressionism" is derived from the title of his painting Impression, soleil levant (Impression, Sunrise), which was exhibited in 1874 in the first of the independent exhibitions mounted by Monet and his associates as an alternative to the Salon de Paris. This website is a non-profits site! Only For Art Lovers!